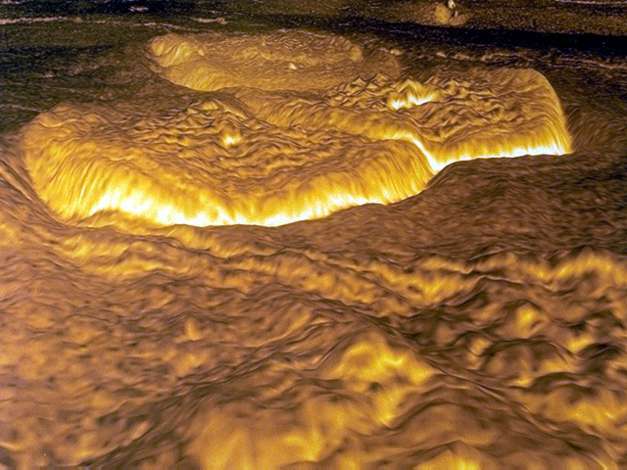 Information: A portion of the eastern edge of Alpha Regio is displayed in this three-dimensional perspective view of the surface of Venus. The viewpoint is located at approximately 30 degrees south latitude, 11.8 degrees east longitude at an elevation of 2.4 kilometers (3.8 miles). The view is to the northeast at the center of an area containing seven circular dome-like hills. The average diameter of the hills is 25 kilometers (15 miles) with maximum heights of 750 meters (2,475 feet). Three of the hills are visible in the center of the image. Fractures on the surrounding plains are both older and younger than the domes. The hills may be the result of viscous or thick eruptions of lava coming from a vent on the relatively level ground, allowing the lava to flow in an even lateral pattern. The concentric and radial fracture patterns on their surfaces suggests that a chilled outer layer formed, then further intrusion in the interior stretched the surface. An alternative interpretation is that domes are the result of shallow intrusions of molten lava, causing the surface to rise, If they are intrusive, then magma withdrawal near the end of the eruptions produced the fractures. The bright margins possibly indicate the presence of rock debris or talus at the slopes of the domes. Resolution of the Magellan data is about 120 meters (400 feet). Magellan's synthetic aperture radar is combined with radar altimetry to develop a three-dimensional map of the surface. A perspective view is then generated from the map. Simulated color and a process called radar-clinometry are used to enhance small-scale structures. The simulated hues are based on color images recorded by the Soviet Venera 13 and 14 spacecraft. The image was produced at the JPL Multimission Image Processing Laboratory by Eric De Jong, Jeff Hall, and Myche McAuley, and is a single frame of a video released at a March 5, 1991, JPL news conference.